Designed for the Livestock Manager to Detect Pregnancy of Cows, Pigs, Sheep and Goats and other Large Animals. * This item has a 10-day Lead Time for Delivery. 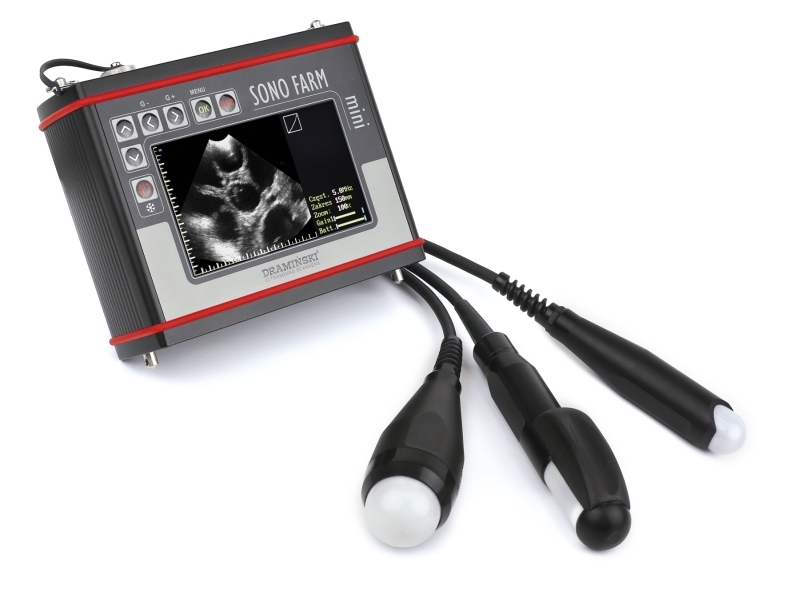 DRAMINSKI SonoFarm mini - an ultrasound scanner for livestock. If you are a modern breeder and you would like to be independent in managing your livestock, you appreciate comfort of work and take care of safety, then SonoFarm mini is a device designed for you. Manage your livestock efficiently with SonoFarm mini. -You Will Increase Economic Indicator Of Your Livestock Your profit highly depends on how fast you are able to detect pregnancy. Thanks to quick detection of your animals’ condition you will be able to manage the process of procreation more efficiently, you will be able to monitor the pregnancy and first of all detect non-pregnant females. All these will help you to increase economic indicator of your farm. -You Will Guarantee The Highest Level Of Safety Having your own ultrasound scanner, you reduce the risk of infecting your flock with disease from another farm. Parvovirus, flu, salmonellosis, chlamidiosis, brucellosis, FMD, rotaviruses and circoviruses are just a few examples of infections and pathogens you can protect you livestock from if you guarantee a high level of biological security. The same equipment used by different farmers is one of the most common ways for disease transmission. -You Can Easily Take It With You It is light. Its weight is just over 1.5 kg. It is small. Thanks to miniaturization of the electronic systems its dimensions are 17.5 cm x 14.5 cm x 6.0 cm. Thanks to its small weight and dimensions as well as extremely effective batteries your work in the field will be a pleasure. -You Will Appreciate How Easy It Is To Operate The Sonofarm Mini The ultrasound scanner has all basic and the most important functions to detect animal pregnancy. It operates in B mode. Its rich intuitive menu navigation makes available all necessary options: freeze, gain and focus. -It Guarantees A Continuous Work Having a spare battery which takes 2.5 h to be charged and can work extremely long, that is 6 h, all you need is a 5-second break to change the battery and continue working. -It Will Help You To Perform Professional Diagnostics The DRAMINSKI SonoFarm mini was designed to detect pregnancy of small ruminants, pigs and large domestic animals. Depending on the probe, abdominal or rectal, you can confirm or exclude pregnancy of a pig, sheep, cow and goat. A multipurpose abdominal-rectal probe “Down Fire” is an excellent solution for specialists of insemination who work with different species. -Choose A Probe Adjusted To Your Needs The SonoFarm mini operates with three changeable mechanical probes with a wide viewing angle: rectal 180º, abdominal 90º and rectal-abdominal “Down Fire” 90º, which can be used for abdominal examination (sheep, pig, goat) and rectal examination (cow). Choosing the SonoFarm mini depending on the livestock, you choose a probe adjusted to your needs among the three available. -Do Not Worry About Its Durability An aluminum body of the scanner guarantees its extreme durability. More than that, the DRAMINSKI SonoFarm mini has a resistible, easy to clean plastic case which protects the device against unfavourable influence of high and low temperatures. -Do Not Worry In Case Of A Malfunction We know how reliable our ultrasound scanners are, that is why we give a 2-year warranty.